Continuing experimenting with oil-based ink on fabric. personal account which is Dutch). I got a lot of reactions and I got very good advice. Thanks to everyone who took the time to respond! water-based ink. Fingers crossed it holds!! Printing on textile with water based or oil based ink? 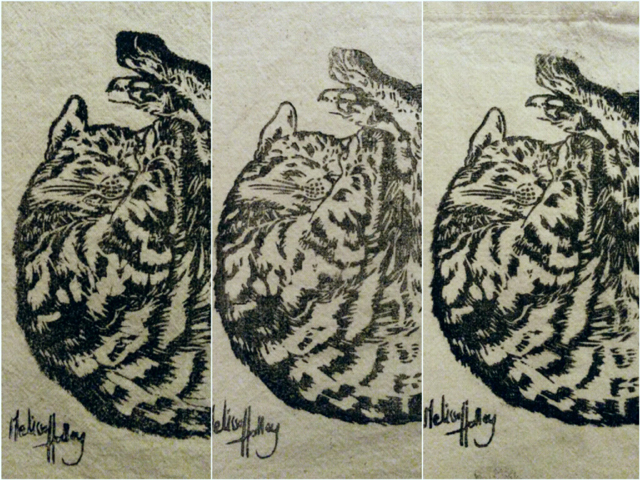 I’ve been using my Sleeping Cat lino from last years’ ‘15 Lino’s in 30 Days’ project. Next to just trying things out by myself I’ve been reading a lot on the internet too. in the Netherlands and having it shipped here is a bit too expensive for me right now. 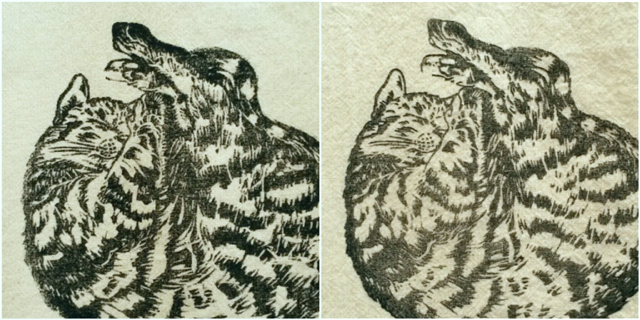 people succeed perfectly in using it for printing lino on textiles. managed to get some good prints. internet. Somehow the results with water-based inks in general are always a bit crude. Not a problem when your design has big shapes but my prints are mostly quite delicate. And now I’m puzzled on how to continue next. I go for the nicer print which I fear will remain vulnerable for solvents like white spirit. 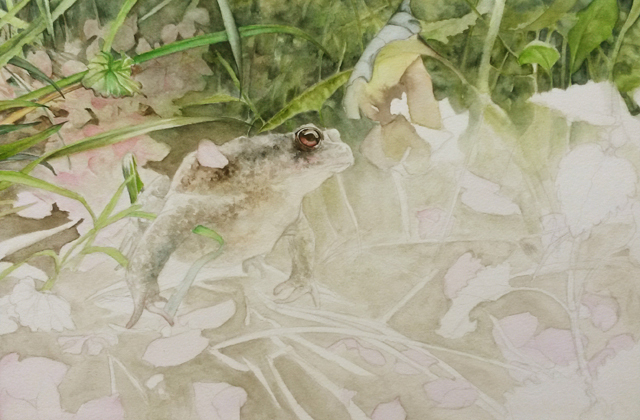 Two weeks ago I wrote a blog about how I mounted watercolour paper on a wooden panel. to the paint as it should with the only difference (maybe) that it dries a little quicker. Next week more about another experiment I’m working on. able to make what I want to make next to a paid job and spending time with friends & family. learned a lot participating for the last two years. For instance I got much better at planning my art and actually doing what I set out to do. Just because I did big projects and I know I can do it again. For the last few weeks I have been working on a small project. Every Friday I carve a bug-stamp. For now there is a ladybug, a firebug, a weevil (from New Guinea) and a common wasp. I'm planning to do a lot more. There are plans for these little critters but nothing conclusive yet. good product for some (a lot of art friends are very positive about it) but it’s just not for me. because of their surface they offer the possibility to varnish your art. cheap to work on these boards. Next thing I tried was mounting watercolour paper to board/ wood and here’s how I did it. all the supplies you need close by because some actions need to be done very quickly. is already very smooth you can skip the sanding part here. Wipe the dust off with a damp cloth and tape the sides of your panel with painter’s tape. Sand again, wipe again and you’re ready to apply the paper. To make sure the paper is applied nice and smoothly have a very clean lino brayer on hand. panel to the paper. Glue it to the paper. Turn your panel with the paper up and use your brayer to even out any glue or air bubbles. When you’re finished put the panel face down back on the paper towels. a board first (bigger than my panel) and then stacked some heavy books on top. It needs to dry like this for at least a few hours. Now your panel is ready to paint! they would take. Also not all brands of supplies are available everywhere. panel which was a great help.